The last few months I've been trying some new beauty products and really have enjoyed all of them. Actually there's nothing I've started using that I'd consider a dud. All of these products are going to become part of my permanent routine! Yes, this is my actual shade "Snow" in the picture. This thing is awesome. It covers AND keeps my face fresh and sort of dewy. My skin is incredibly dry and for the most part this fits the bill during the winter months. I've only tried it in cool/cold weather so I'll be interested to see how it works in the summer. I'm a mascara junkie and am always trying new kinds. I bought this as a trial size and quickly bought a full one once I started using it. It gives definition and volume and doesn't flake away like my other beloved Maybelline Great Lash did. Plus it doesn't seem to dry out as quickly either. I really am a huge fan of this. Now, I'd NEVER used a damp sponge like this for foundation application, EVER. I'd only ever used my fingers or a brush. This has revolutionized how my foundation looks. The brush was kind of harsh on my face and I couldn't get decent coverage with just my fingers so this sponge literally changes everything. I'd researched the Beauty Blender but went with this one because it's WAY cheaper. And all the Youtube reviews I watched said it was comparable to the BB so why not save a few dollars, right? This is my new best friend. My shade is 42 Rose Femme and this lipstick is great. The staying power is excellent. It stays on on while eating and drinking and I only reapply once after the initial application. It's moisturizing at first and then dries a little but it's not an uncomfortable dry like some lipsticks. Its actually appears pretty matte after it dries and isn't shimmery or satiny. (at least this particular shade) On me it's much more brown but on someone with darker skin it's probably more pink. I get a lot of compliments when I wear this lip color so it's now in permanent rotation. NYX has knocked it out of the park with a non-orange HAC stick. My shade (Light) has a nice taupey brown color for the contour which is perfect. For me, most bronzers are too red or orange so this is just right. The consistency is creamy, like a lipstick, so it's great for dry skin and to blend out with my sponge. I use the contour side more than the highlight (for everyday) but the price point is so good on this I don't mind replacing it without having to use up both sides. A+++! 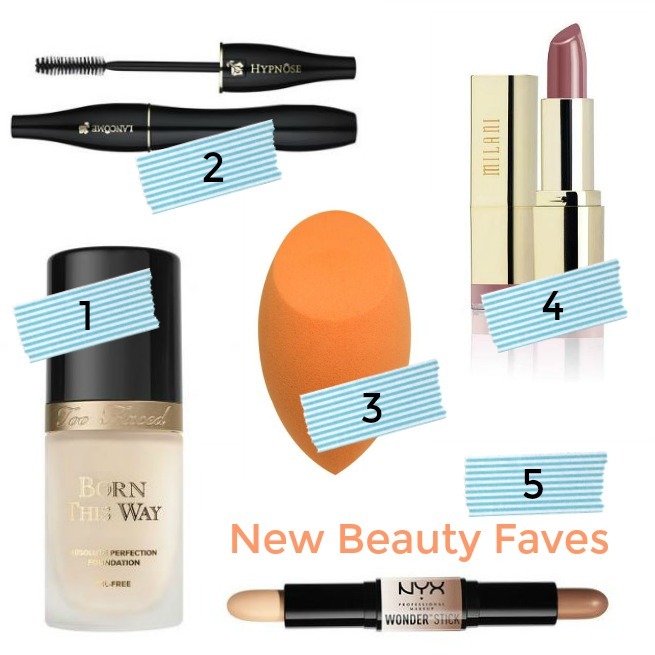 Have you discovered any new favorite products lately? No new favorites lately! I always enjoy posts like these though.